Classic Cars Talks: CCT back to business!! Unfortunately some unfortunate events in my personal life kept me away from this blog for a couple of months but this time gave me a chance to collect a lot of material for future posts. Let's get back to business by taking a look at a couple of interesting cars capable of being "future regrets". My first choice would be an old passion of mine and in my opinion one of the cars that still awaits the respect it fully deserves, especially here in the UK. This Lancia Beta Montecarlo is advertised also on ebay for £1200 and no reserve. It sure needs some works to get back on the road, but it seems quite solid in the pictures and it would definitely be worth a trip. If you are not familiar with the gifted and troubled mid engined Beta Montecarlo take a look at this website. The second eye catcher on ebay lately has been this Berkeley T60. I've asked my dear friend Ray Bell (from the Berkeley's Club) for a quick description and evaluation. "Berkeley produced about 4200 cars altogether, from 1956 until 1961, when the company went out of business. The T60, launched in August 1959 sold more than any of the other models - altogether around 1800 were made. 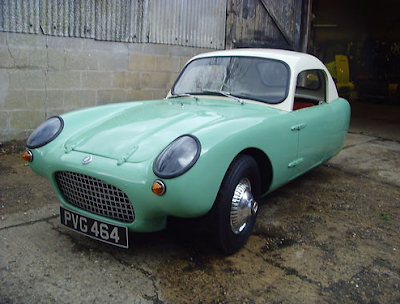 The design was derived from the earlier 4 wheeled 'Sports 328', using the same 328cc Excelsior twin 2 stroke engine, with a 4 speed gearbox driving the front wheels. Much of its popularity was due to the fact that a three wheeler could be driven on a motorcycle licence provided that the reverse gear was blanked off. Increasingly these ground-breaking cars are seen as classics worthy of restoration, and this T60, fitted with a comparatively rare hardtop, looks like a good specimen of a standard T60. Typically a well restored T60 will fetch £3,000 - £3,500. " At the moment 17 bids are fetching £2,800 but are not crossing the reserve price yet. My bet is that the car will get closer to £4.000 than £3.500 but I have a feeling it will not be enough for the reserve. I will definitely keep an eye on this auction, the ingredients are the ones for a complete oddball. The seller doesn't know how to spell and anyway doesn't seem to know the correct name of it. 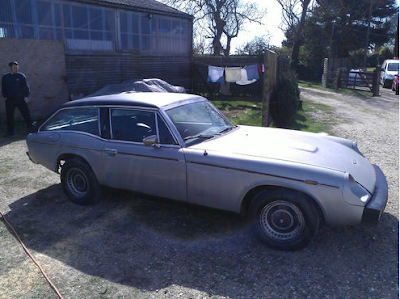 It is in fact a Jensen GT (as it says on the bumper) and not a Jenson Healy or a Jensen Healey, the connection with Healey ended in 1975. The description and pictures would keep me away from it but 15 bids certainly show a lot of interest for this attractive shooting brake. Only 473 were ever made and under the bonnet there should be a 1.973cc Lotus twin-cam, but with perfect examples being evaluated around £6.000 I would say that this is a far cry from a wise investment. 15 bids, £460 so far, 4 days and no reserve make for an interesting auction to keep an eye on, thou. A little update on this post. 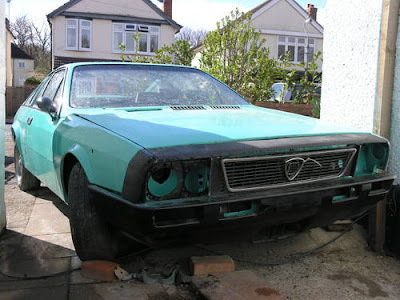 The little Lancia didn't sell in that auction, but luckily found an owner later on via another website, possibly. The prediction on the Berkeley was correct, £4201 were not enough for the seller. He tried again but unfortunately lost track of the auction. DFoes anyone know what happened next? The "Jenson Healy" traded for £920. I guess the price could be right for someone that has got access to a workshop. In my opinion the car is worth the effort.